The 80 page Guildhall Petty Cash Book is the secure and high quality way to keep all your petty cash records in one place. 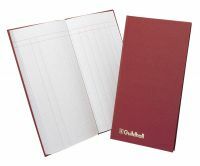 Sized to be kept in the petty cash drawer, this book is precision ruled with 1 debit and 7 credit columns to comply with even the most demanding of professional standards. Made from high quality paper, the pages of this book prevent ink show-through leaving you free to write on both sides of the paper.